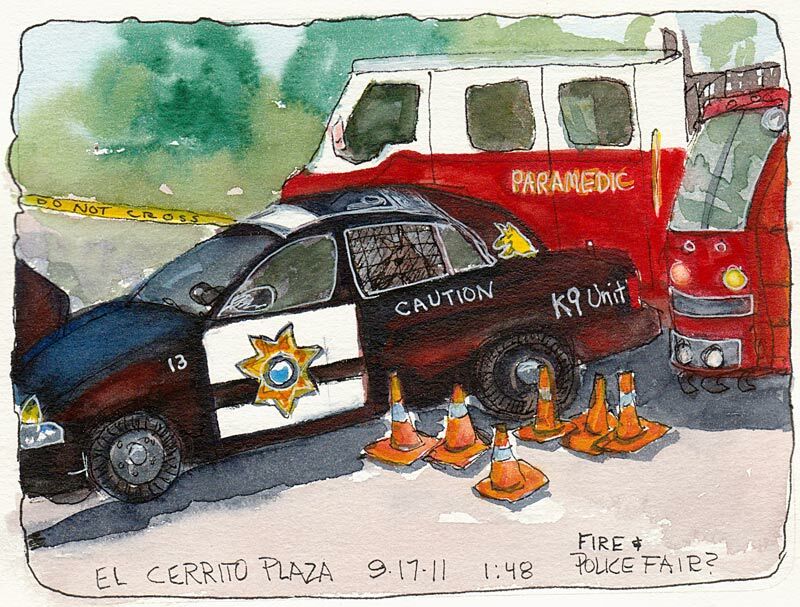 K-9 Unit, Paramedics and Fire Truck, ink & watercolor, 7x5"
The parking lot at El Cerrito Plaza was filled with police cars, fire trucks, hazmat vans and other emergency responders when I walked up there to do errands Saturday. Contrary to my sketch above, which looks like a police car crashed into an ambulance (thanks to a little drawing flaw), it turned out to be the annual Tri-City Safety Day. I sat on the curb and sketched while cops, firemen and other public safety people handed out fire hats, pencils and buttons to kids who got to climb on police motorcycles and fire trucks, and explore the DUI checkpoint trailer. The K9 patrol car was off limits when I was there, as King was standing guard inside, barking if you got too close. I heard that earlier he’d been out and available for petting but I bet the huge German Shepherd scared off more kids than enticed them. Wow! I don’t think I would have attempted sketching such a complicated scene but trust you to make it doable! This piece is very dramatic and quite the story. You drew the scene with unease nicely. Beautiful work.